Senate President wants you know that he is not eyeing President Muhammadu Buhari's seat, at least not in 2019. Saraki, a member of the ruling All Progressives Congress, APC, said reports making the rounds that he will run for the presidency are false. An aide to the Senate President, Yusuph Olaniyonu, said there is no iota of truth such claims. 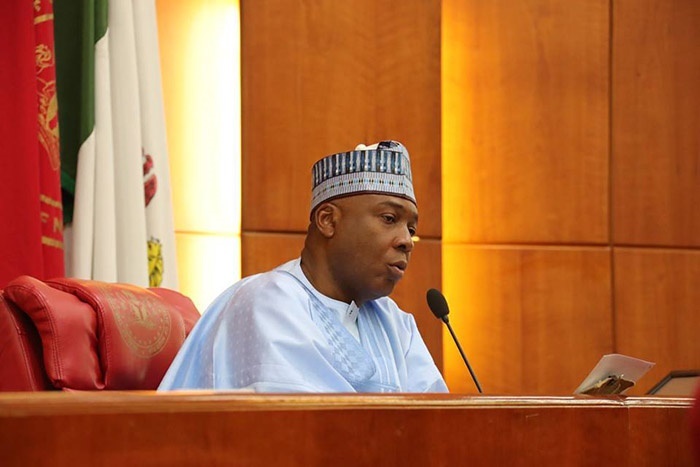 The Boss, a newspaper managed by veteran journalist and one time presidential candidate, Dele Momodu, had reported that Saraki will join the 2019 presidential race. But Olaniyonu said the report is false. ALSO READ - Obasanjo To Buhari: "You Are A Failure"
"... If it is true that he is contesting, you would have seen the report in major dailies since last week Saturday when the news broke out on social media. But as you can see, there is nothing like that,” Olaniyonu said. The dismissed report also said that Saraki, a member of the APC, is considering adopting Deputy Senate President Ike Ekweremadu of the People’s Democratic Party, PDP, as his running mate. In 2011, Saraki declared his interest to contest for the presidency under the banner of the PDP. He, however, stepped aside for Atiku Abubakar, the consensus candidate adopted by the northern aspirants in the party at the time.